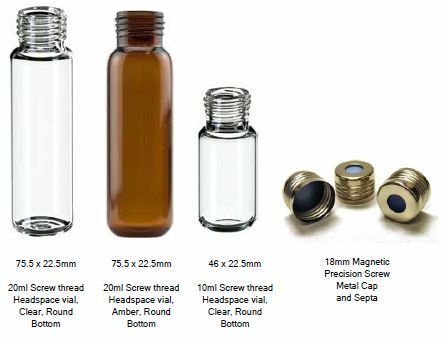 Screw Headspace caps, septa, and vials are designed especially for use with Agilent and CTC rotating or robotic arm samplers. Certified by GC/MS to be contaminate free for VOC analysis. 10ml, 20ml clear or Amber precision thread vial. Magnetic screw caps 8mm center hole. Septa are blue PTFE sample side; White Silicone outside. The precision screw-thread vial always be applied to Shimadzu, Spectra-Physics, Varian, and other autosampler. The clear one is made of USP type 1. Caps are made of high quality aluminum，precise manufacturing tolerances, well-controlled Manufacturing environment. Magnetic precision screw-thread metal cap is combined the ideas of innovation and time-saving and convenient together. is combined idea of innovation and time-saving. The method of patent to produce chemical inert cap is to integrate the cap and the septa together at the molecular level, which can avoid excessive evaporation and keep the sample bottle proper sealing.